Sliding Patio Doors are years ahead of older sliding doors you may have fitted in your home or may have previously used. Now benefitting from substantial improvements in design, operation and function they are the perfect choice if you are looking to create panoramic glass walls and benefit from the largest possible glass panels to look through. Patio doors can far exceed the sizes possible with typical bifolding or swing doors, making them ideal for today’s modern extensions and house renovations. Additionally they are perfect for balconies, porches and smaller spaces where you require an inline sliding door. The Advantages of aluminium sliding patio doors. 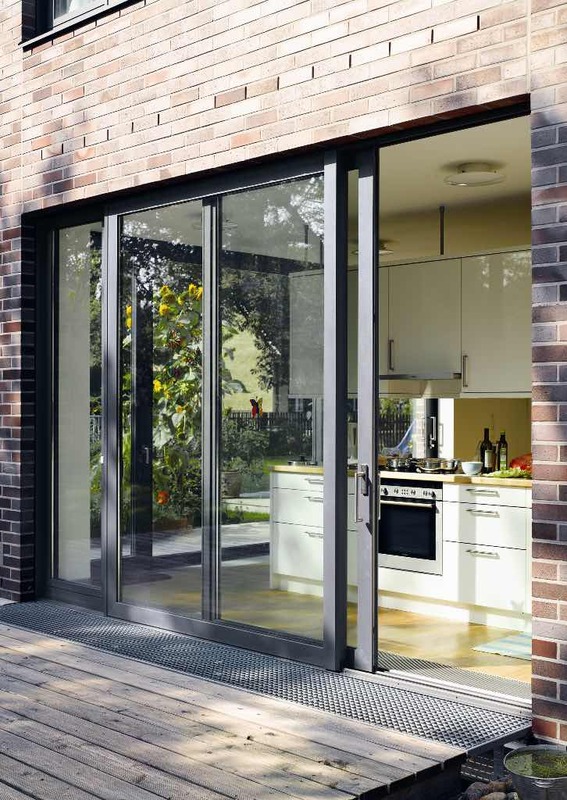 For the replacement of existing patio doors, modern aluminium sliding doors benefit from direct fix framing meaning you no longer require hardwood subframes typically found on older doors. For flats, apartments and patios, they are ideal where other types of doors leading to outside spaces can restrict your outside space. For new extensions and renovation projects we can help you choose the right sliding door that will make the most of your views and living spaces. Top Quality hardware giving many years of reliable service. Contemporary styles and flexibility in how door panels slide and move. Schuco Doors are one of the slimmest sliding doors on the market and can be made at up to 3 metres high and 3 metres wide if desired. Offering the latest in design, manufacturing and smooth operation, Schuco doors have little restriction in how they can be made and configures. The Reynaers name in sliding doors is synonymous with doors for bespoke high end homes and discerning customers. Backed by one of the global names in architectural aluminium, Reynaers doors offer exceptional security, reliability and performance. Our expertise on sliding doors and providing you with the latest innovations and technology in home improvements is second to none. Contact us to help you choose your ideal sliding door or glass sliding wall.